Friendship III is a 46' Sea Ranger which is one of the most comfortable trawlers in her class. This is a ruggedly built vessel with great sea keeping ability. Her twin Volvo diesels provide a steady 8 knot cruise, great economy and very long range. This vessel has been owner maintained since purchased by a knowledgeable hands on yachtsman. Spacious saloon with great visibility. Forward stateroom and full head. Master suite aft includes full head and third stateroom mid-ship can be utilized as an office and guest stateroom. This vessel has the largest sundeck and flying bridge of any her class and shows extremely comfortable areas to lounge. Triple Reverse Cycle Air with aft master upgraded, 8KW Genset w/2641 hrs. A whopping 850 gals fuel in 4 tanks, cruise at 4 gph, and a huge 350 gals water capacity makes this the best long range live-a-board you could buy for the money. 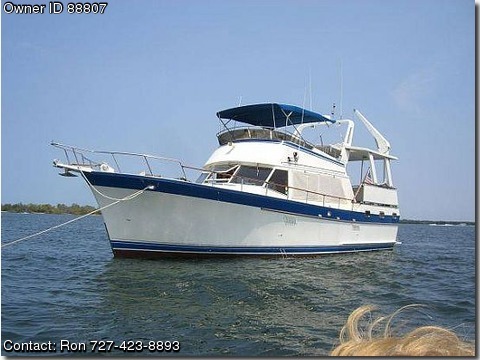 This vessel is in very good condition and has been well maintained by a knowledgeable hands on owners. From her gel-coat which shines down to the clean and maintained bildges. Brokers Remarks: Good selling sun-deck yacht and heavily imported in the 80?s and gets solid high marks for heavy construction and a massive build. Roomy accommodations, galley down was available but the roomy three stateroom was the most popular as this one is optioned with the deck house galley which leaves entertaining with chef involved while prepping the goods. ?Friendship III? includes full teak interior, large engine room, separate stall showers in each marine head, and the largest aft sundeck of any in her class. Very roomy and wide open! Note: Seller is motivated due to travel plan change. She will show as best as they come in this vintage of masterly well thought out yachts! Call anytime and can be seen anytime! Accommodations: : as you enter onto side access to captain fly door on starboard you may enter at this location or aft to sundeck to massive sundeck with ample seating for up to 12 to 16 seated aft to the long extended swim platform, then forward on sundeck to massive flybridge with built in teak table for lounging as well as capatians chair and large helm control area. Aft back to sundeck to aft entryway door into salon with galley to port with u-shaped entry with all the conveniences of home which opens up to a large and expansive salon with ice maker island to starboard with sofa settee to port which leaves a huge floor area with lower helm to starboard, down steps to forward office/guest stateroom with tasteful office suite built in for work on the go, out to companionway to V.I.P. stateroom with extra large marine head and shower. To rear of yacht down companionway to master berth with large queen suite berth with large master head with shower and large roomy feel to all areas on interior. She boats wide side-decks for ease to foredeck and aft for launching and retrieving vessel.